Countess Greffulhe (1899); Otto Wegener - photographer. Otto Wegener, known as Otto, went to live in Paris in his late twenties. He opened a photographic studio on the Place de la Madeleine in 1883 and became well known for his elegant portraits of women and children. 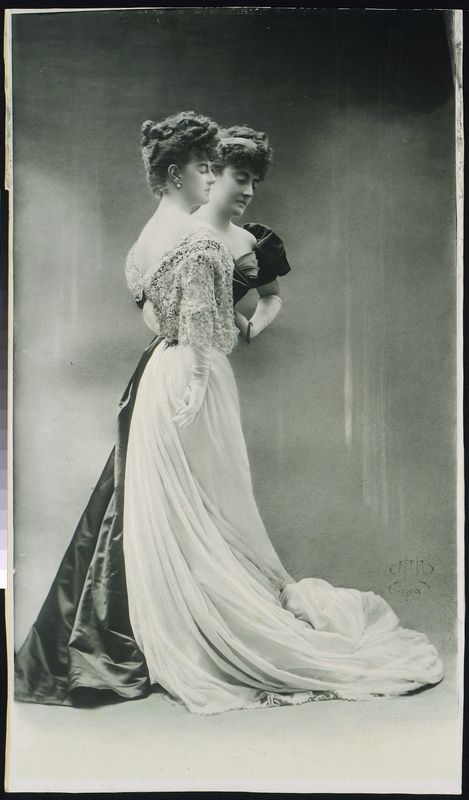 Celebrated as the supreme beauty of her day, Countess Elisabeth Greffulhe (1860-1952) was the triumph of Parisian society when Marcel Proust made her acquaintance in 1892. Proust pursued her with requests for a photograph, which she staunchly refused. Nonetheless, the countess would inspire Proust’s fiction, becoming a prototype for the glamorous Duchesse de Guermantes in “A la recherche du temps perdu” (1913-27). In this puzzling image, the countess is seen embracing her own double. As was Otto’s custom, the image is heavily reworked in the negative, emphasizing the contrast between the two figures, the white expanse of lace bodice and billowing skirt shown against the dark taffeta of the dress. Heightening the effect of a ghostly apparition, the countess’s eyes, to which Proust ascribed the whole mystery of her beauty, are, unexpectedly, closed or averted; indeed, the image is less a portrait than a dreamlike evocation of a woman’s private self. Portraits in which the sitters appear to be conversing with their doubles were not unusual in the 1890s. They were achieved by making several exposures on the same photographic plate. The idea for this composite portrait, which combines two negatives, probably originated with the countess, who had studied photography with Paul Nadar and who shared with many eminent figures of the day an abiding interest in spiritualism and the paranormal. The photograph brings to mind images of spectral phenomena obtained at séances. A keen observer of the effect she produced on others, and not herself unmoved by her own beauty, Countess Greffulhe was not, however, oblivious to the ravages of time, and wrote of the day that the mirror would no longer be kind. Was this photograph intended to be the mirror that would not betray? Perhaps not coincidentally, the photograph hung in the countess’s private apartments until her death. It has not been seen publicly until now.